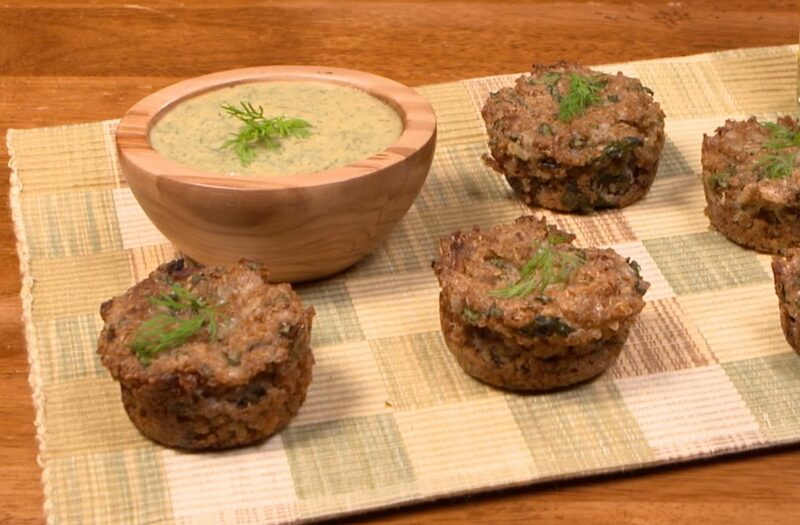 A terrific, make ahead appetizer that reheats well and is sure to become a favorite! Preheat oven to 400° Spray mini muffin pans w/ olive oil spray. In a wire mesh strainer, rinse quinoa thoroughly until water runs clear. Bring quinoa and broth to a boil in a medium saucepan, cover and reduce heat. Simmer 15 minutes. Set aside to cool. Combine quinoa, garlic, onion, spinach and cheese in large mixing bowl. Place flax and water in a small blender and process. Add flax mixture, rice vinegar and salt to the bowl and mix thoroughly. Spoon mixture into prepared pans and pack firmly. Bake for 45 to 50 minutes, or until baked through. Combine dipping sauce ingredients in the order listed in a small bowl, mixing thoroughly. Cover and chill until ready to serve. Calories 119, Protein 4g, Carbohydrates 14g, Fiber 4g, Fat 5g, Cholesterol 0, Calcium 36mg, Sodium: 285mg.